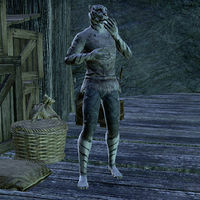 Abizzaka is a Khajiit that may appear in the Smuggler's Den and a possible target of the Black Sacrament. As part of an escalating prank war, his friends apparently enlisted the Brotherhood's to "give him a scare". Unfortunately for Abizzaka, the Dark Brotherhood does not operate that way. Blackest Sacrament 15 Assassinate every target named by a Black Sacrament contract when commanded to by the Speaker. This page was last modified on 16 March 2019, at 18:13.